Today: A classic fondue from Piedmont, because Italians do it better. Depending on where you're from, fondue may conjure up images of 1960s dinner parties with pointed sticks poised over a colorful pot filled with oozing, warm cheese. It might make you think of Switzerland or even France, and cold evenings in the mountains around a bubbling pot of gruyère and wine. But here's another recipe to add to that imagery: a regional specialty from Piedmont, which, let's face it, has had its share of culinary exchanges with its northernly neighbors France and Switzerland. The Piemontesi do what they do best with their dishes: they add truffles. Piedmont is one of Italy's prime truffle growing regions, and it is famous for that most prized and most mysterious fungi of all, the white truffle, which is hunted and gathered in the forests around Alba. Truffles are an extremely valuable and prized ingredient -- but they are so bountiful in this area, particularly at this time of the year, that they are featured in a number of Piedmont's most traditional recipes. And despite the price tag that comes with a truffle, its best is brought out in simple, homely dishes like this fondue. Truffles are the perfect partner to cheese, eggs, or anything creamy -- and does not need much cooking. In fact, grated or sliced thinly, raw, and perhaps with just the heat of the food it is served over is the best way to experience them. 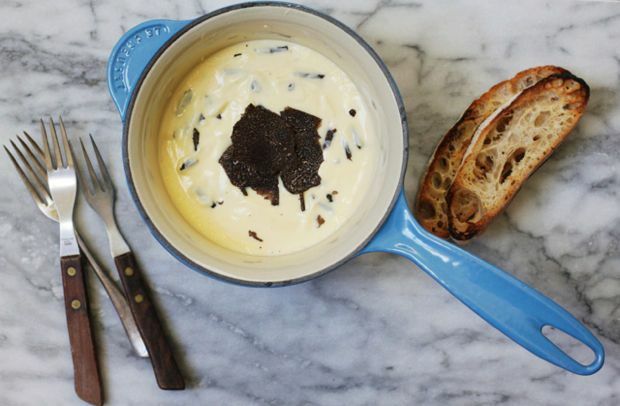 And it's good to know that a little goes a long way when it comes to truffles. This fonduta is just the thing. The recipe, which hails from Alba, is the most traditional, simple recipe for fonduta you could ask for; it has been translated and adapted from the cookbook, Nonna Genia, a treasure of Piedmont's cuisine by Beppe Lodi. While the Swiss like a hint of garlic with their fondue, made of gruyère melted with wine, the Piemontesi save their wine for drinking. Fontina, egg yolks and milk are warmed together over a bain marie. The melting mixture is then laced with shavings of fresh, pungent truffle. Use black, if you can't get white, but steer clear of truffle oil, which is usually a chemical concoction. Keep the fonduta warm. Then take a nice baguette or loaf of ciabatta bread, toast it if you like, and watch it happily disappear. If you ask me, Italians do it better. 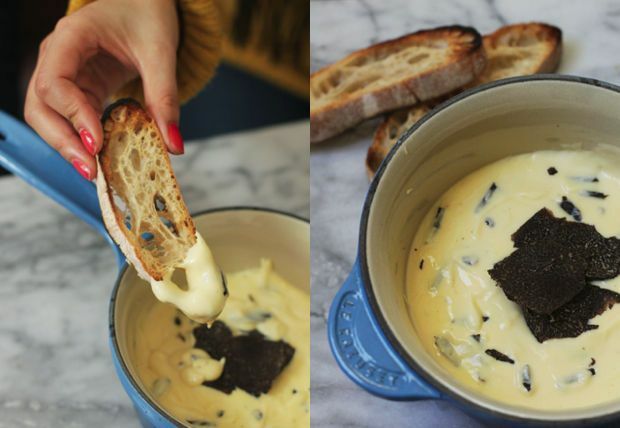 This looks just divine, I love anything cheese and fondue is my go-to dish when I'm just too busy and tired to cook, this elevates it into something elegant! I just did a class which included Fontina Val D'Aosta, the traditional cheese used for fonduta. This looks gorgeous and I think if you are going to make something this nice with truffles, find the real fontina. The rich complexity of the flavor will reward your effort. That's a really good point. In the US it's more common to find the Dutch fontina (in the red wax coating), and I imagine for this recipe Emiko means Italian fontina.